I LOVE personalized gifts. There is nothing better than getting a gift that someone put a lot of thought into. I was thrilled when I came across Mummi Quilts. Mummi Quilts was created by a grandmother named Eeva, "Mummi" to her grandchildren, who started sewing again when her grandchildren were born. She made quilts for them and before you knew it she had people putting orders in for their own. So Mummi Quilts was born. I was very happy when she offered to send me a designer stroller blanket for review. She even personalized it with Isabella's name. It is so cute! I received the "Joyful" stroller blanket. The quality is amazing. 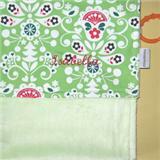 One side has an adorable patterned cotton fabric, the other side is chenille. I love the chenille side. It is so soft and cuddly. Check out this pic. As soon as Bella saw it, she asked if it was hers. She lay it on the floor and got comfortable for a nap. It was very cute. The blanket also comes with a link, so it is perfect for the stroller. No worries of the blanket falling and getting lost. Mummi Quilts also makes other personalized gifts. Choose from aprons, bibs, shopping cart covers, nursing covers, stroller bags and diaper bags. All you have to do is choose the fabrics you like best and let "Mummi" know what name you want embroidered and you have the perfect gift. I love that all the items are handmade by Eeva. I also am a fan because it is a Canadian company and I enjoy supporting other Canadian mommies (and grandmommies). You really should check out her website if you're looking for that one special gift. So want check out her work first hand? Eeva was kind enough to offer a personalized designer bib to one of my loyal readers. All you have to do is become a GFC follower and then go to Mummi Quilts and tell me which fabric is your favorite. Can it get any simpler?